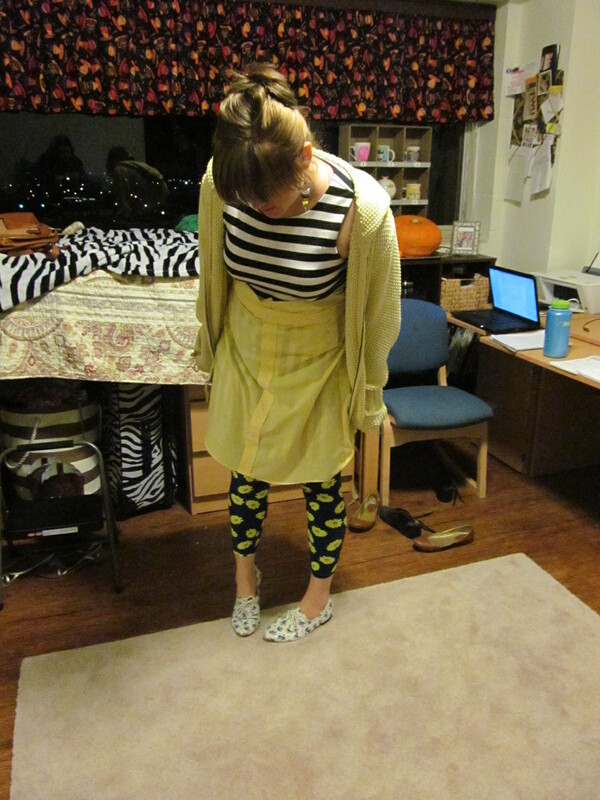 The best way to feel cheerful is to wear yellow, right? I thought so. Originally I though this looked a little thrown together, but I got quite a few compliments on it, so it must have looked better than I thought it did. I got these tights from a store in the mall (they have leggings two for $10! ), and they are legit so. soft. 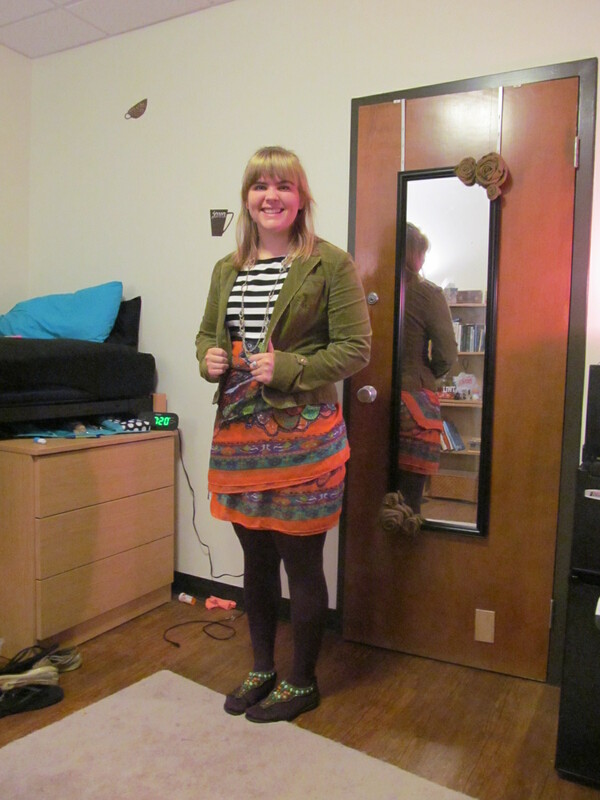 I also wore the skirt that I made out of a men’s dress shirt and my blue flower oxfords. 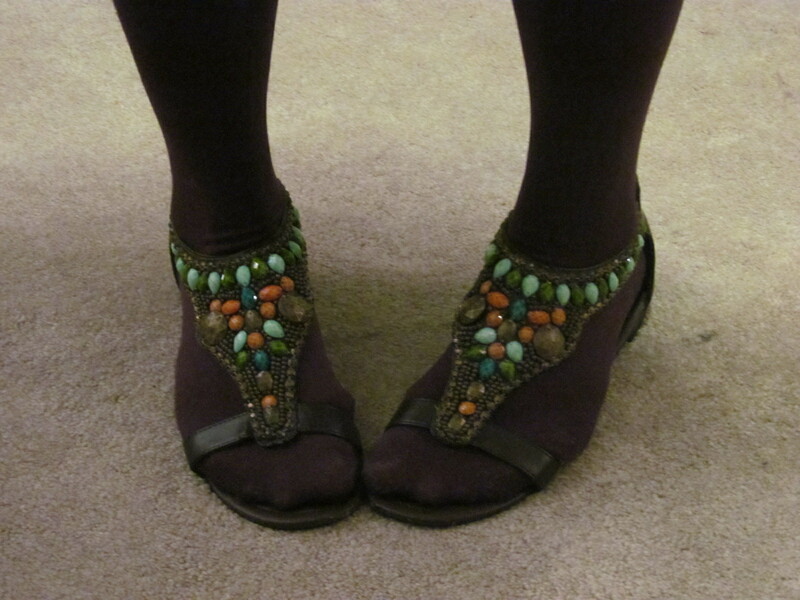 I bought these shoes with my friend Jessica and she asked, “what are you even going to wear those with?” to which I replied, “um, everything?” So far I’ve been right. I love them! I went to my first class without the yellow sweater and it was pretty cold, so when my second class got out a little bit early I ran back to the dorm and grabbed it. I’m also wearing my daisy ring and my blue ring from the Dominican Republic (but I wear that every day, so it only matches by coincidence). Aren’t we the cutest? Internet, meet my friend, Lucy. Lucy, meet the internet. 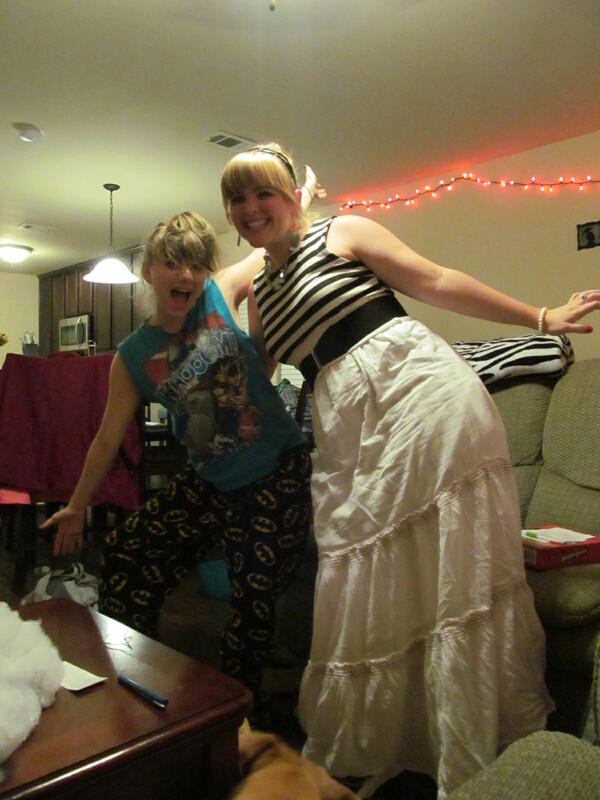 These pictures were taken quite late on Friday night, which is the explanation for the craziness of our faces/poses. 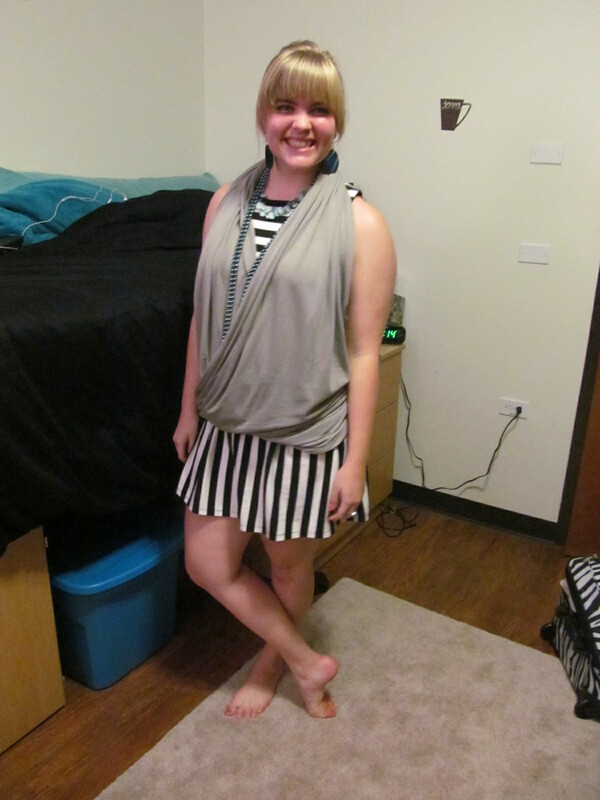 I wore The Dress with a white maxi dress folded down into a skirt over it, and a belt over that. 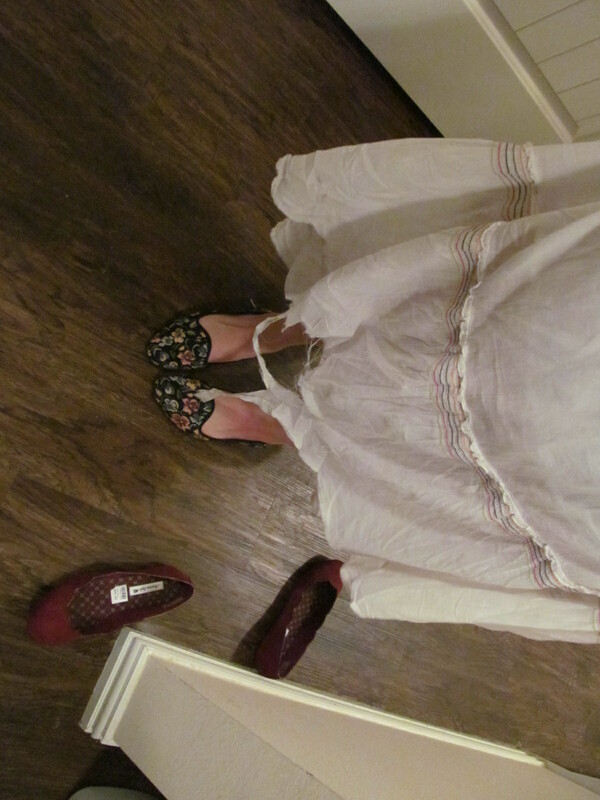 Unfortunately, it started POURING down rain while we were out, so on the run from the car to the house, I stepped on the edge of my hem and tore the maxi dress. I think I’ll be able to take it up and hem it at the next rouching line, but then I’ll only be able to wear it as a skirt, not a dress. Oh well, at least I didn’t get too wet in the downpour! Also, fun story: we went into CVS right before it started raining and while we were checking out one of the workers came in with the “V” from the outside of the building! It had fallen off the building in the wind and rain, and was almost as tall as the guy who had brought it in. It was quite the experience! Has October sneaked up on anyone else? I feel like yesterday it was August and the first day of school! 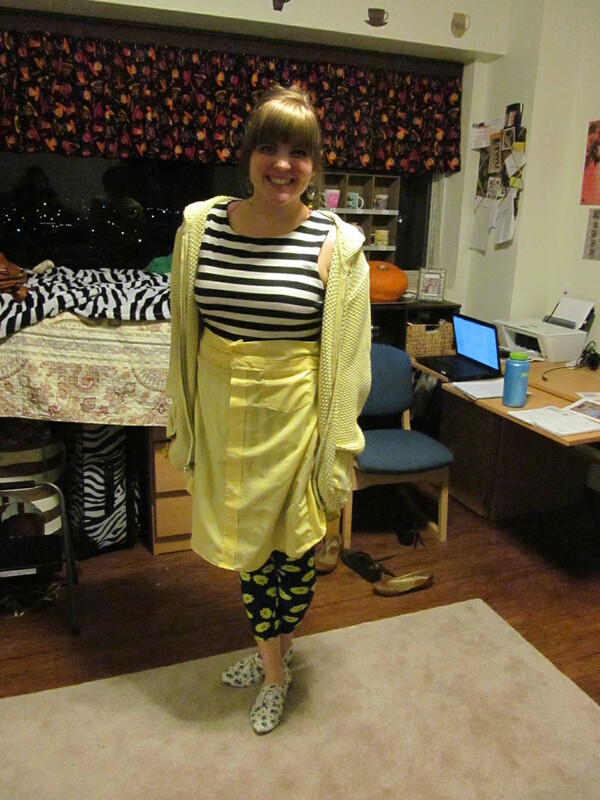 However, tomorrow is the first day of October and thus the first day of The October Dress Project! 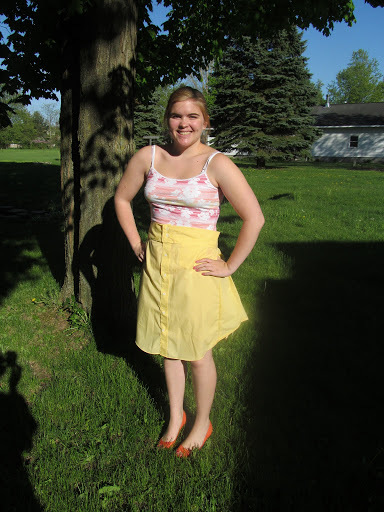 (more information on the project here) This will be my third year doing the project, and I’m really excited to do a maxi dress this year! 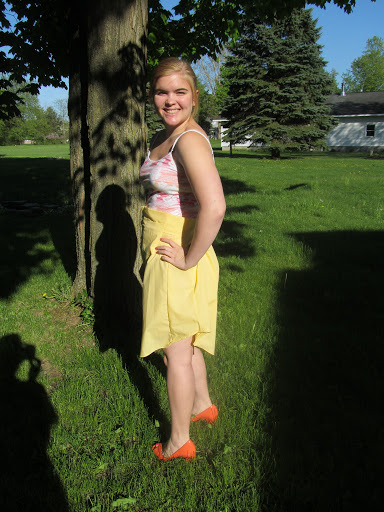 The first year I did a red dress (I hadn’t made the blog yet so I don’t have any posts including that dress), which was pretty challenging, but not too bad. 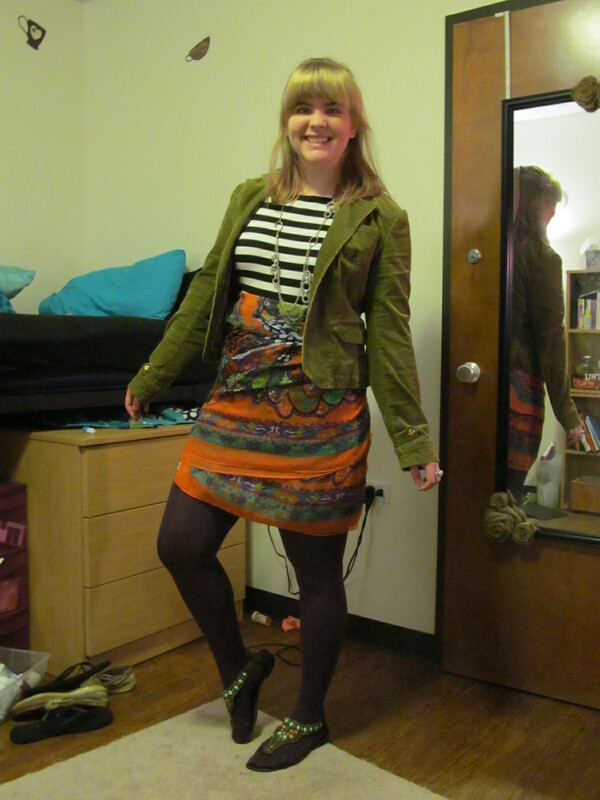 Last year I did a short black dress (see all of last year’s posts here), and that was pretty easy. So I thought I’d do something more difficult this year. Enter the maxi dress :). 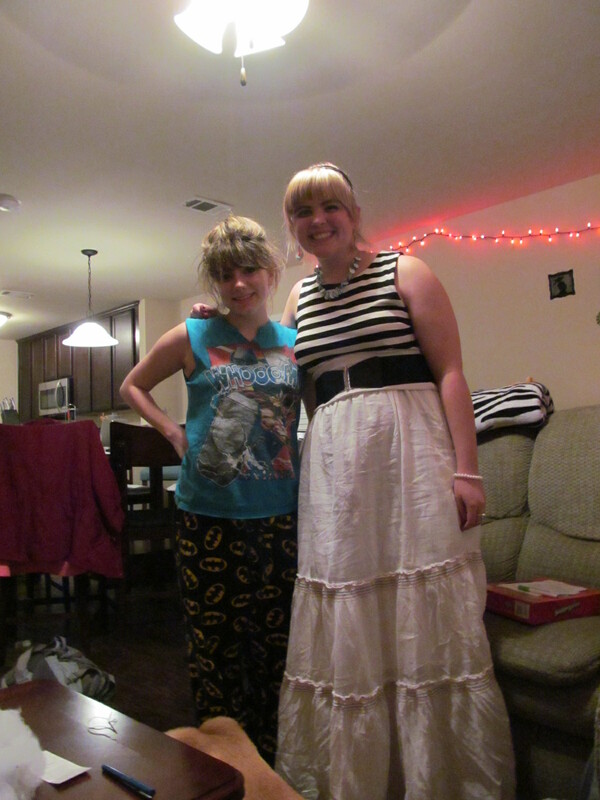 I would have shown you how it looked on, before alterations, but you probably don’t want to see that.. It was QUITE the v-neck. 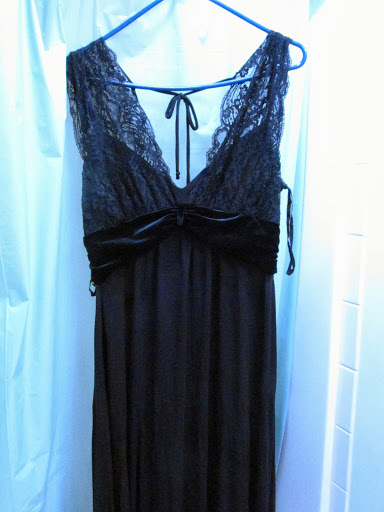 I got it at Salvation Army for a few bucks, thinking that if I could add some fabric to the top it would be great and if not, I didn’t waste too much money. Well once I got started, I decided the velvet needed to be taken off too, so it turned into kind of a long project, but I really like the way it turned out! 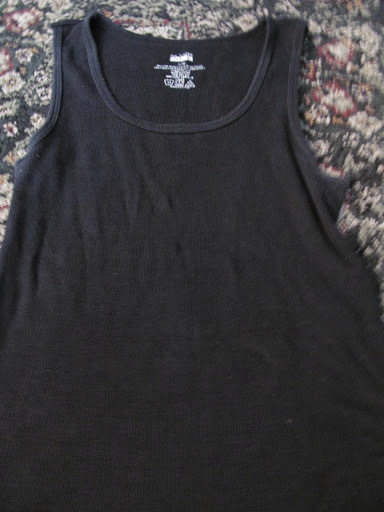 I had a black tank top that I thought I’d just add to the existing top. After seeing how that looked, however, I decided I needed to cut the top out first, and then sew the lace to the tank top, then sew the tank top to the skirt again. 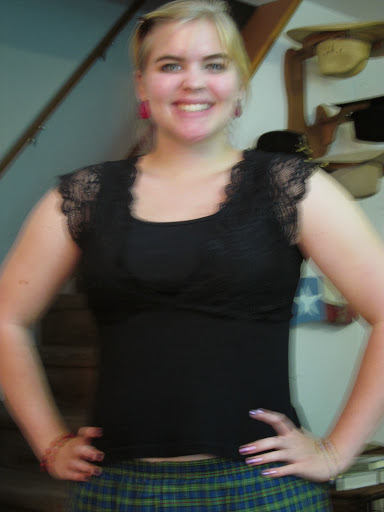 Sorry for the blurry pictures, but at this point it was like midnight so it was pretty dark in my house.. After the lace was tacked to the shirt I just sewed it back onto the skirt (which I had taken the velvet off of. If I ever seam rip another seam it will be too soon!). You’ll have to wait until tomorrow for the finished result as I haven’t taken any pictures of the full dress yet! See you tomorrow! 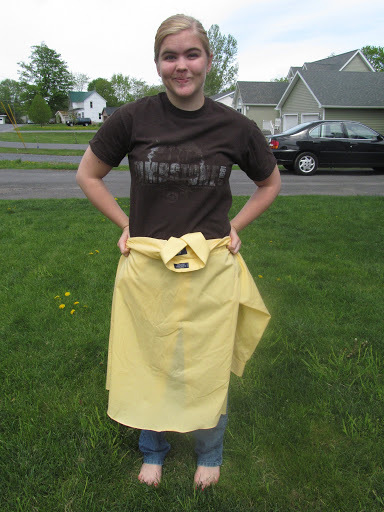 So I was browsing Pinterest (how many of my stories start with that phrase, I wonder…) and I came across a pin to refashion a men’s dress shirt into a skirt. I knew I had to try it. Unfortunately, when I pinned it our sewing machine was in South Carolina. That didn’t stop me from buying the materials, though! 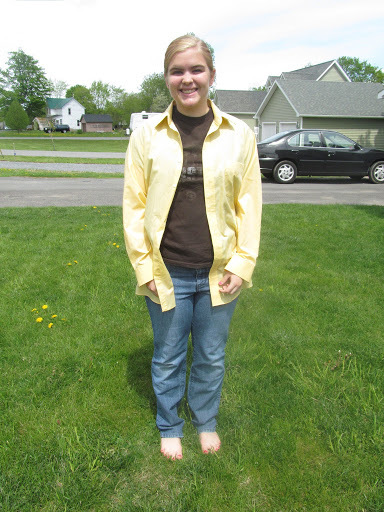 I got the men’s shirt from a thrift store for (I think) about $2. 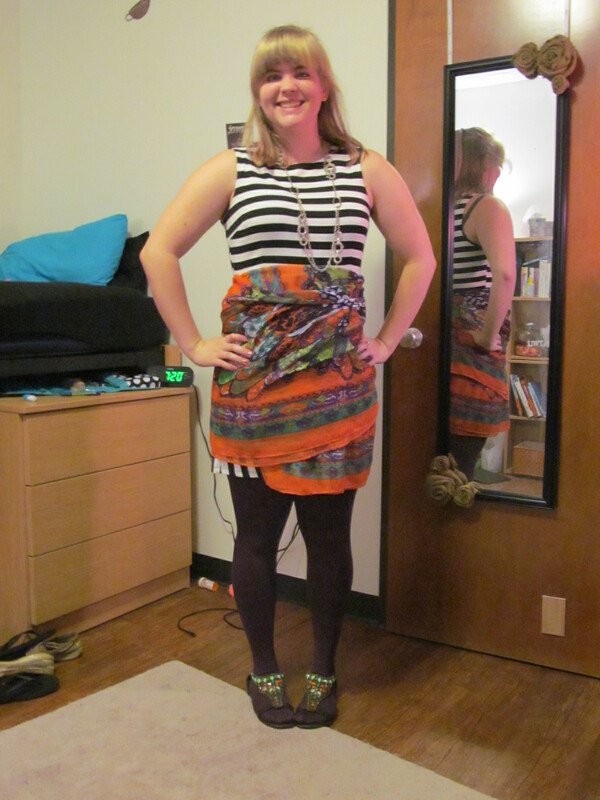 3 months later I actually made the skirt. This is what the shirt looked like when I bought it. 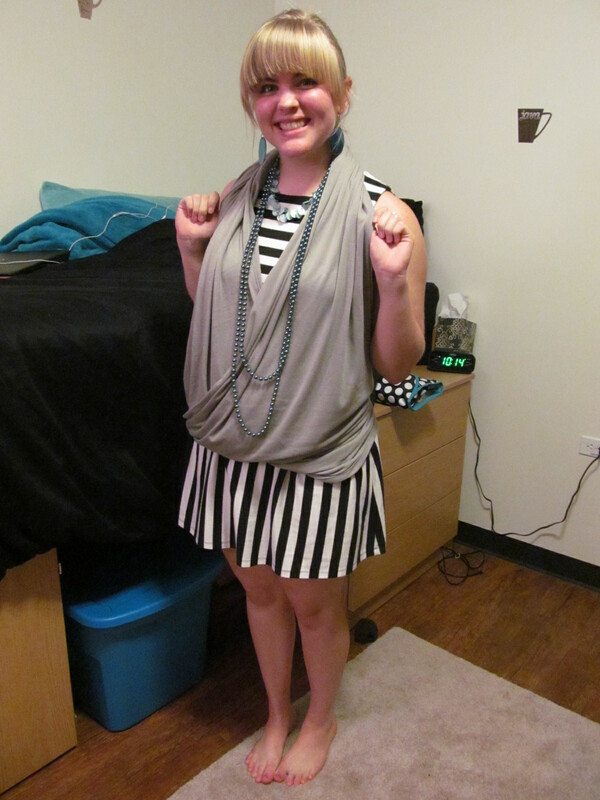 Side view: it goes up on the sides and is slightly longer in the back, giving it a slight high-low effect. So how did I do it? I followed these directions. Basically, cut off your sleeves with the seam on the sleeve side. 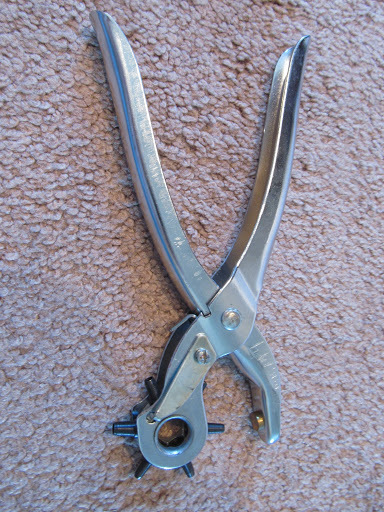 Cut as far up as you are able to get the collar off, making sure you get the back yoke. Take a skirt that already fits you and measure the back against the back of the shirt. You should fold the shirt so all the buttons are on one side and the middle of the back is on the other. 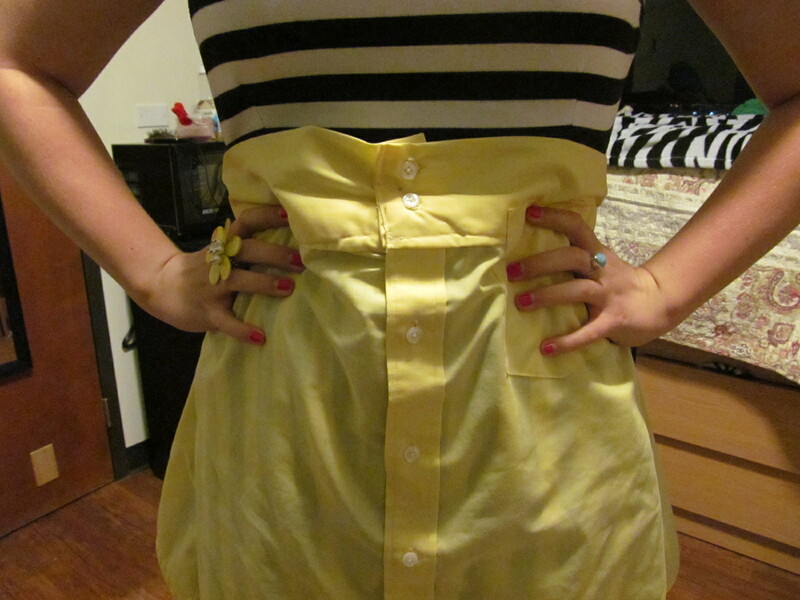 Fold your skirt so the middle of the back matches the middle of the back of the shirt. Cut around the skirt. For the front you just lay the front of the skirt against the front of the shirt (lain normally, not folded) and cut around it. Then, if you picked the right size men’s shirt you can simply sew your front and back together and you’re done. However, if you picked the wrong size shirt because you were guessing instead of measuring, you can cut up your sleeves and add more fabric to each side of the back. Then you sew your (newly larger) back to the front. 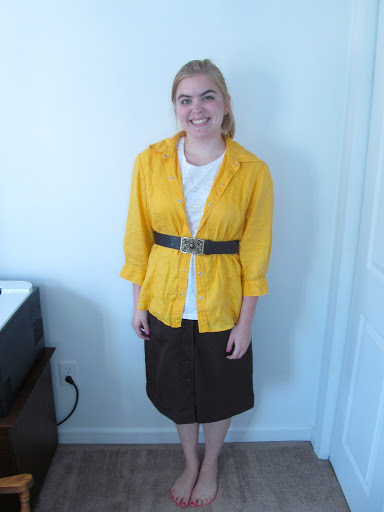 You can make a waistband out of the other half of the sleeve and sew that to the top, making pleats as needed. 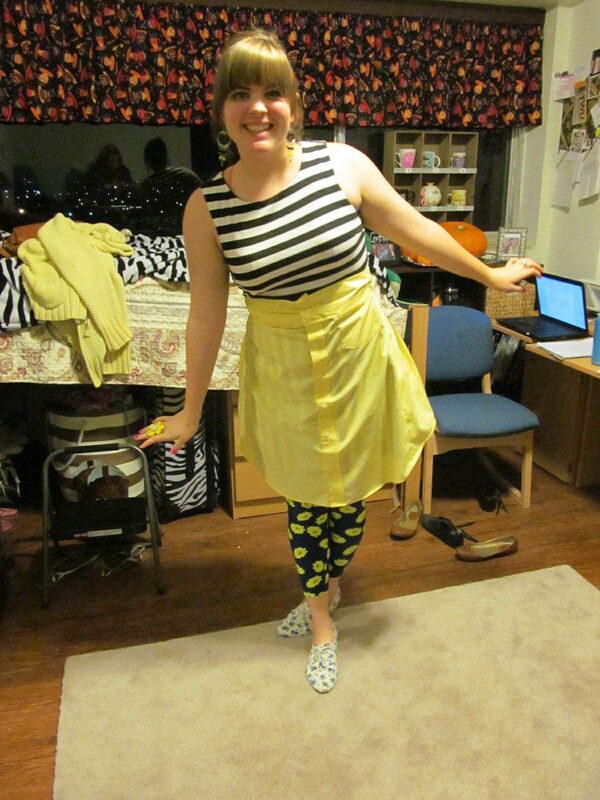 Then you hem the bottom, sew the front together so your skirt doesn’t flap open, add buttons to the waistband so your skirt doesn’t fall down, and voila! You’re done! 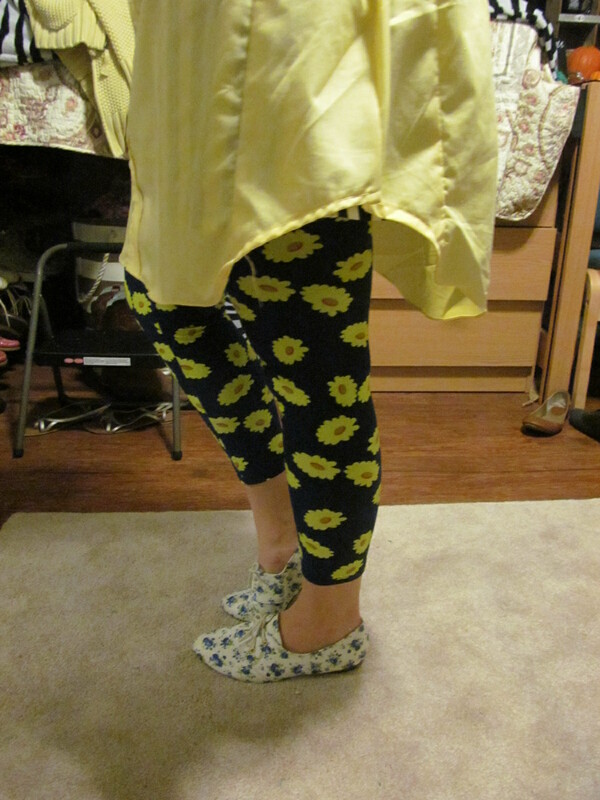 I left the hem of the shirt as the hem for my skirt because I liked the look of the high-low, but you can straight hem around if you like that better. What do you think? So on Saturday my mom and I helped with a fundraising yard sale. You know what they say about yard sales? You bring a box to donate and come home with two boxes of stuff you bought! While that wasn’t quite true with us, I did find several things for us to buy! The good thing about yard sales though, is that you get a ton of stuff and you only spend $2.50. Anyway, back to the project at hand. 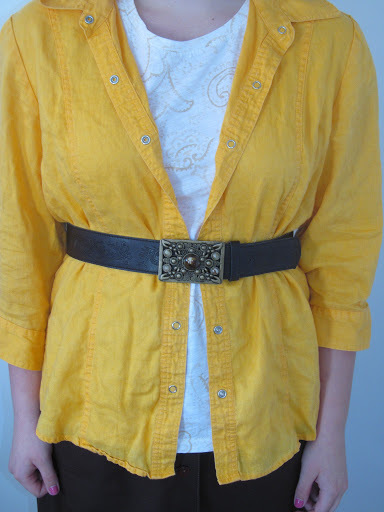 While we were at the yard sale I saw a super cute belt that I had to have. I love belts. I just recently found out that I love them, so now I’m expanding my collection. I used to hate belts. 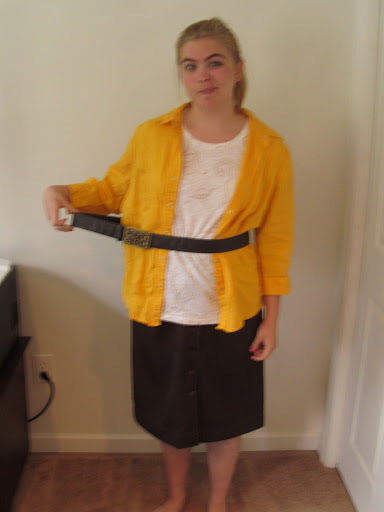 My mom would always bug me about how my pants were too loose and I needed a belt, but I never wanted to wear one. Totally different story nowadays! I wear them even when I don’t need them. 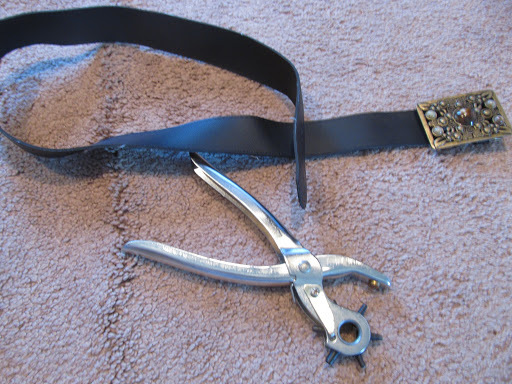 So I convinced my mom to buy this belt (I didn’t bring any money in a valiant attempt to not buy anything…you see how much good that did…). It was only 50 cents for goodness sake! The only problem was it went around my waist a time and a half. It was WAY too big. But we bought it anyway because I knew I could cut it down and resize it. What do you know, I was right! The rest of the project is super easy if you have one of these thingymajigers. Nice technical name, huh? I thought so too. I have no idea what they’re really called. Anyway, you just measure where the middle is and how big the previous holes were (that will tell you how big the hole has to be for the buckle to go through). I did all the measuring for the first hole, but then I thought of the genius idea to just overlap the piece with the original holes onto the piece I wanted my holes to be on and punched away.